Newly released UAD Software v8.3 adds a simulation of the AKG BX 20, a late-60s spring reverb. Universal Audio introduces at Musikmesse a new generation of Apollo Thunderbolt 2 audio interfaces as well as an Apollo FireWire. Apogee has released new installers that add remote control via Logic Pro X and Logic Remote for their audio interfaces. Focusrite opened a page on its website where they detail the products that are compatible with the new Apple OS X Yosemite. 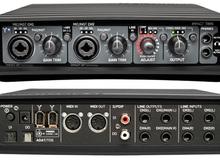 Focusrite will launch in June a new Saffire Pro audio interface that will support 18 inputs, 8 outputs, FireWire and Thunderbolt. The digital audio interface market is very saturated (pun intended) with lots of brands and many new models struggling to find their niche. TC Electronic released the v3.0.0 update for their Konnekt and Impact Twin audio interface software. Focusrite posted yesterday a note about the compatibility of their Saffire FireWire interfaces with the new Thunderbolt technology.